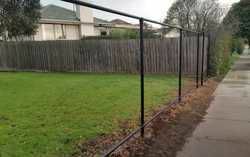 SAS Fencing provides all types of cost-effective solutions for Schools around Melbourne. 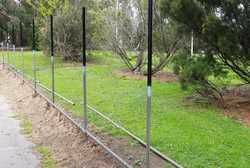 One of the more popular solutions to reduce the costs of a new perimeter fence is to re-use and extend the existing fence posts. This saves on the costs of digging new post footings, supplying new concrete and half of the posts! To ensure loose bits of wire are not lying around your School, we carefully cut and remove each piece. 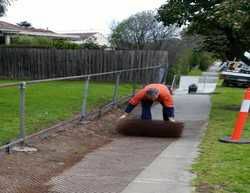 If the mesh is in good condition it can be re-used in other less noticeable locations around your School. NOTE: the mesh and wire in the picture above is rusty and going straight to the tip. The working area is barricaded of to protect the children and public. 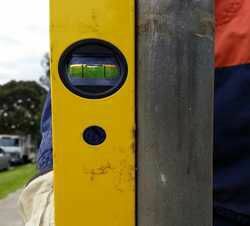 We also scan the area with magnets to ensure all the loose pieces of wire are picked up. School fences over 20 years old are generally made with heavy wall posts and pipe. Therefore the posts can be straightened without breaking. Any posts that do need replacing, will be detailed within the quotation before starting the job. 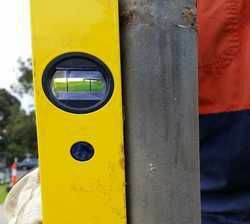 Our initial site inspection will determine if your existing posts can be re-used and straightened effectively. Once straightened we extend the posts to the new height you want. All of the post extensions will be fully welded for maximum durability and strength. All of the welds are cleaned and painted with a cold-gal primer to protect the weld from rusting. On-site welding is either shielded or done within a barricaded work area to ensure the children and the public maintain a safe distance. It is vital to the durability of your fence that the post extensions are fully welded. 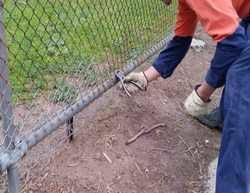 If extensions are not welded, over time the top half of the fence will start to lean forward and become a hazard. Your existing pipe rail and fittings can be re-used as well - saving further on costs! Any pipe that is bent or has rusted through the surface will be replaced, but the rest can be re-used. The old fittings can be re-used as well and once painted black they look like new. 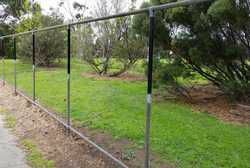 The initial cost of heavier mesh helps to significantly increase the longevity of your fencing, as the mesh is generally the first part of the fence which gets damaged. But the money your School will save by re-using the existing posts, pipe and fittings, will pay for the investment of thicker mesh. 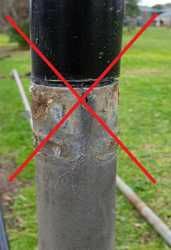 Generally any visible rust on old pipe is on the surface only, which is cleaned off easily. Any pipe that has rusted through the surface will be replaced with new powder coated pipe. Painting the old pipe will dramatically improve the appearance of your fence and your School. 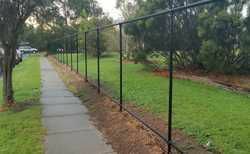 STEP 5: New mesh, wire and gates are installed to suit the height you want - your old fence is now a new fence! With the new mesh, wire and the old pipe painted black, you have a new looking fence at a height to provide better security for your School. The new gates will open and close easier as well. 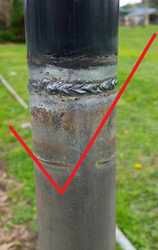 If you select the heavier wire this will increase the durability of your refurbished School fence. Contact Paul or Shaun for an on-site visit to assess if your School's existing fence can be extended and restored.